Hello, Da Vinci Design students! Next year’s spring musical is going to be…GREASE!!! Auditions will take place during the first week that you come back after winter break. If you are interested in participating, text @dvgrease to 81010. We’ll send you all the info there. If you have college applications that are due on January 1-3, 2017, all that you have to do is to submit your application by the deadline. The colleges will know that our school is on break, and will accept transcripts and letters of recommendation when we return. As long as your application is submitted by the deadline date, they will wait for the other materials. Please remember to check your email on a regular basis for college acceptances. Many colleges will provide you with instructions on how to set up your portals and this is important as this is where they will let you know if you have any missing materials from your application. Also, please let your counselor know when you have been accepted to a college so that we can send out transcripts when we return. Don’t forget to send your test scores to the colleges that you have applied to. To send ACT scores, go to your www.actstudent.org and for SAT, go to www.collegeboard.org and look for ‘send scores’ and search for the colleges that you have applied to and send your scores to them. IF you don’t send them scores and you are accepted (especially California state colleges), they can rescind your offer of acceptance. If you are applying to TASS(Telluride Association Sophomore Seminar)–Please don’t forget to work on your application and request your letter of recommendation from a teacher. The deadline due date is January 10th and you have three essays to complete totaling no more than 4,500 words. Please refer to the links listed below for more information. Counselors can provide assistance upon our return to the office. Today is a full school day! Today is a full school day, running from 9-3:55 pm. Please disregard any prior message you received stating that today is a minimum day. Our sincere apologies for any confusion this may have caused. Week 17 – POL Week 2! Designers, excellent work on your POLs thus far! Presentations across grade levels are proving to be incredibly thorough and professional. We are, as always, very impressed and look forward to seeing your continued success during Week 2 of POLs. We also want to celebrate the parents who have been able to attend POLs. Thank you for your involvement and presence. Next week is the last week of the semester. We will be running POL schedules on Monday, Tuesday and Wednesday, then we will start at 9am on Thursday for an all day schedule where students go to all classes. Parents – do you work in an industry that will one day employ our future Da Vinci graduates? We want to invite you to help shape Da Vinci curriculum at our Project Pitch Panel on Wednesday, January 4th from 9am-12pm. At this event, teachers will present their project ideas to industry professionals and seek advice on real world connections, student engagement, software, and a range of other topics. You will be able to interface with innovative Da Vinci teachers and other industry partners. It really takes a community to make sure school is relevant – your critiques, suggestions, and creativity will be incredibly helpful to ensure the delivery of real-world curriculum. Help shape the future workforce and inspire teachers! Please pass along the invitation to others and bring members of your team. RSVP to Natasha Morse at nmorse@davincischools.org if you would like to attend and see the attached flyer for more information. Week 16 Update – POL Week 1! 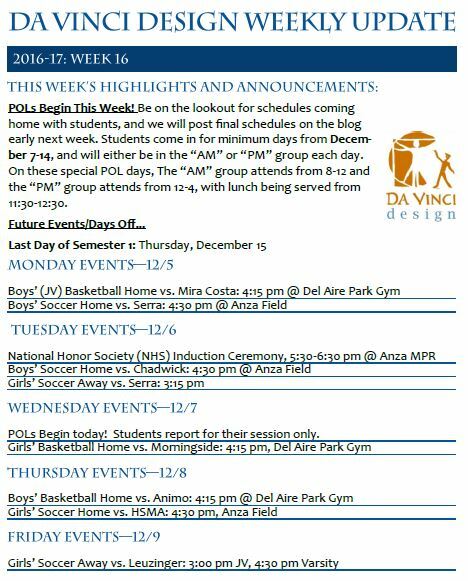 Designers, POLs begin this week! Make sure to practice and ask for feedback from your teachers before your presentations. 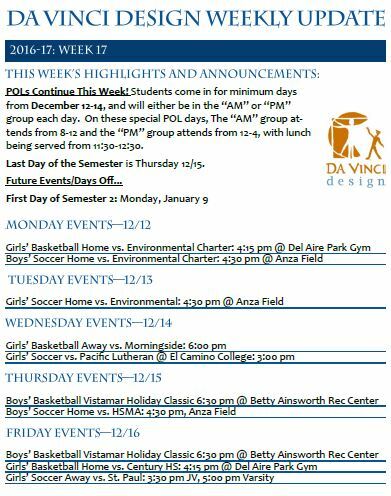 Please contact us with any questions regarding the POL schedule. We wish you the best of luck!